It’s A Canada Day Miracle For Gas Prices | En-Pro International Inc. In what might be described as a Canada Day miracle, the price of gasoline across the country is expected to be the lowest it’s been in seven years for a July long weekend. 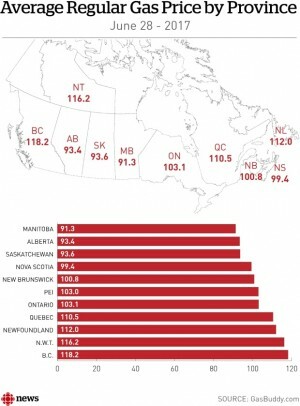 According to research done by GasBuddy.com, gasoline prices in Canada are averaging $1.04 per litre, 14 cents per litre lower than the 10-year average. That’s the lowest since 2010, even though gasoline taxes have risen in many provinces in the past seven years. As well, in a rare switch, gasoline has been less expensive in June than it was in January. Summer gasoline blends have fewer emissions and are more expensive to refine, one of the reasons why gas prices move up in the summer. A downturn in the price of crude, which has hovered around $45 US for the past several weeks. Lower than expected demand for gas as the summer driving season starts. Large inventories of gasoline in the United States. According to Roger McKnight, a senior petroleum analyst with En-Pro, demand for gasoline in the United States is lower than it was a year ago. According to the U.S. Energy Information Administration, demand over the past four weeks is 1.6 per cent lower than it was a year ago. Much has been said about the inventories of crude oil in storage around the world, but there is also more gasoline in storage. Canadian gasoline prices tend to be based on U.S. wholesale market prices, which are set daily by refiners. Refineries in the U.S have been working at near full capacity to get ready for what was expected to be a busy summer driving season, but demand has yet to come through as expected. “Much like at the retail level, [refineries] compete with each other for customers, and if they have a lot of gasoline to sell, they will lower the wholesale prices,” said Michal Ervin, a gasoline market analyst with the Kent Group. According to data supplied by Kent, refiners are making four cents less per litre this June, compared with a year earlier. While lower gasoline prices are good for drivers, sluggish demand for gasoline on the market does not bode well for the energy sector, which has been hoping for a busy driving season to draw down inventories of crude oil around the world. “The best-case scenario is that we get the summer demand that we’re anticipating, because the driving season is really cranking up both in Europe and here in North America,” said Jackie Forrest, director of research with the Arc Energy Research Institute. However, the lower prices in the market may help to spur that demand. GasBuddy estimated that U.S. gasoline prices are at their lowest level since 2005, with gas averaging $2.21 US per gallon, almost a dollar lower than the 10-year average.